BOSTON, MA -- Another week has come to a close in the Eastern Hockey League Premier (EHLP), as we are getting closer and closer to the postseason. This past week featured 11 out of the 13 EHLP teams in action, with a number of intriguing matchups. As always, with plenty of great games there were a number of worthy candidates for our weekly honors. 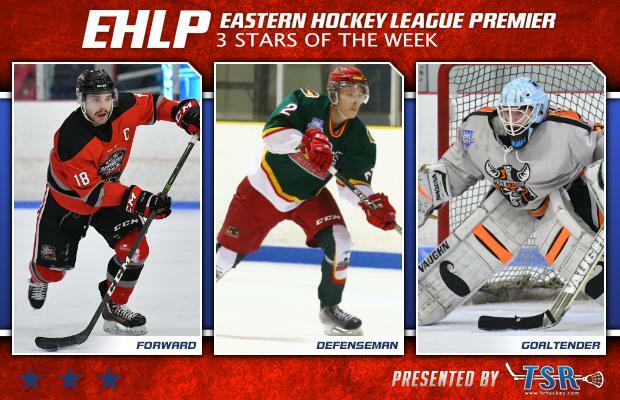 The EHLP is pleased to announce that Nick Terry (Walpole Express), Tom Skold (Vermont Lumberjacks), and Jake Lakatos (New Jersey Renegades) have been named the TSR Hockey Stars of the Week. This upcoming week includes 14 more games from Wednesday to Sunday. The next set of TSR Hockey Stars of the Week will be released on Monday, February 26th at 4:00pm. Catch the EHLP action all season long on HockeyTV. Terry and the Express went 3-2-0 over the past week as the forward collected four goals and three assists over the five games. The '98 the key catalyst on offense when he scored a pair of goals in his team’s 5-1 win over the New England Wolves on Friday. After this past week, the Norton, MA native leads his entire team in scoring this season with 18 goals and 25 assists (43 points). The Express will get back to work this upcoming week with a trio of home games starting with the Valley Jr. Warriors on Wednesday, followed by a pair of games against the Vermont Lumberjacks on Saturday and Sunday. Skold and the Lumberjacks went 2-1-1 this past week as the defensemen made his impact felt from the blue line with nine points over the four games, including a six-point outburst against the Walpole Express on Wednesday. The '99 recorded three points in the series against the Boston Jr. Rangers this past weekend to give him a total of three goals and six assists for the week. The native from Sweden has collected 18 points in just 16 games for the Lumberjacks this season, after starting the year with the organization's Eastern Hockey League (EHL) team. Skold and his squad have just four games remaining in the regular season and they will face-off against the Express for a pair of games this upcoming Saturday and Sunday. The Renegades won both of their games this past weekend and Lakatos was between the pipes for their 5-3 win over the New Jersey 87s on Saturday. The '99 stopped 40 out of 43 shots in the winning effort for his 7th victory of the season. After this past week, the New Jersey native now owns a 2.99 GAA and a .919 save percentage for the year. This is Lakatos’s third weekly honor this season (TSR Hockey Stars of the Week #14 -- TSR Hockey Stars of the Week #22) as the netminder has settled in nicely since joining the Renegades in October. The Renegades will finish up their regular season this upcoming weekend with a home-and-home series against the Central Penn Panthers. 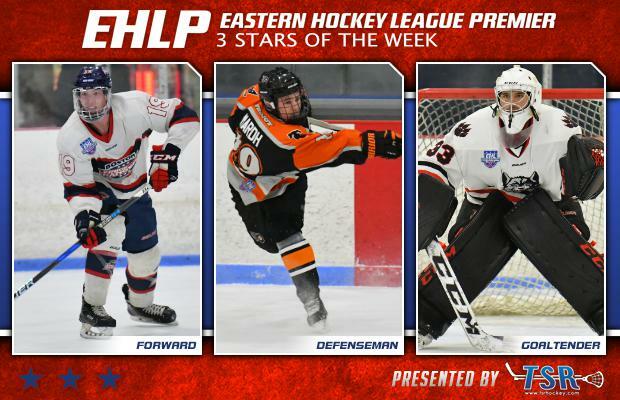 The EHLP would also like to recognize a trio of honorable mentions starting with Matt Wood of the Philadelphia Jr. Flyers. Wood collected six total points in the three Jr. Flyer victories this past week. Nick Graziano of the New Jersey Renegades had an assist against the New Jersey 87s this week, followed by two big goals including the game-winner in his team’s 6-4 win over the Philadelphia Revolution on Sunday. Last, but not least, Eric Roy of the Vermont Lumberjacks posted a 2-1-0 record in three games this past week including a 42-save shutout against the 1st place Boston Jr. Rangers on Sunday.